So, Saturday night we headed downtown to a party. A new group of people for me to meet. It was card night. I’m absolutely terrible at cards. I mean it. I’m awful. I played with the group of girls and they were awesome. The sweetest group. They laughed hysterically as they taught me to shuffle the deck. I even won the first two games…lucky number seven! There’s a first for everything I guess. It was a blast. The spirit of the night, must have given me some outfit inspo. In an effort to brighten my style, I found a bold, red statement coat (similar here) that I fell in in love with. I actually own this coat in several colors and it’s a perfect weight for layering, as well as to wear on it’s own. I found a black and white Moschino hearts scarf (similar here or here), which was the perfect accessory for the coat. It was just the contrast that the coat needed. I wore I sheer polka dot blouse (similar here), solid black pants and my favorite velvet and satin boots (similar here) for texture. 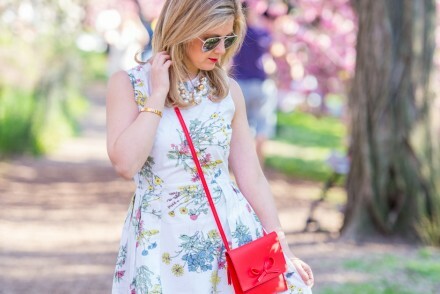 I finished off the look with my Furla cross body bag, and Valentino sunnies (similar here) (.